Imagine attending a party with 3,700 guests, and 1,100 hosts. That's just what we did aboard Carnival Liberty on a 5-day cruise from Port Canaveral to the Bahamas. 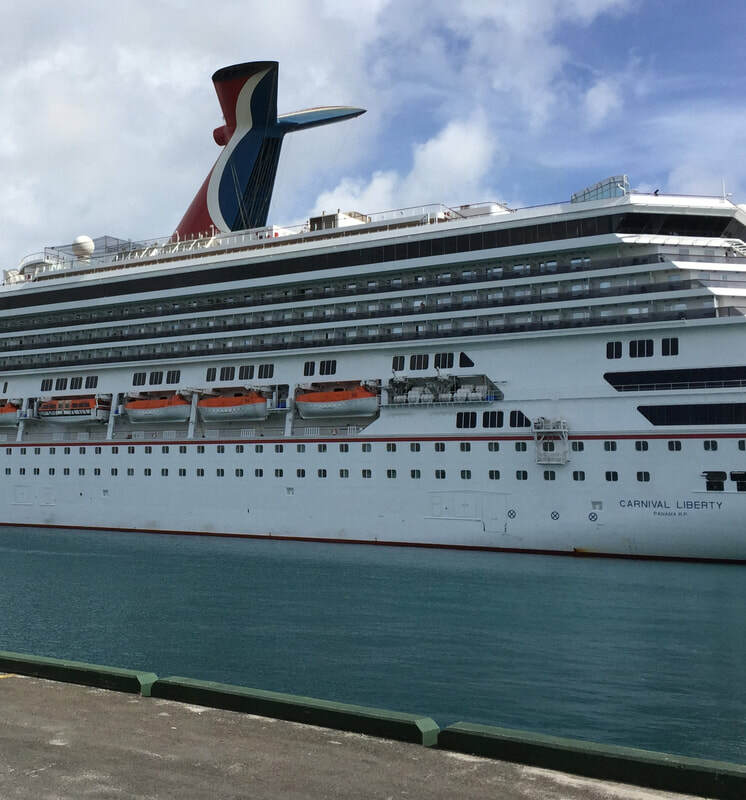 Besides making our first visit to Freeport, and our first departure from Port Canaveral, we wanted to sample first-hand how Liberty stacks up to Carnival's "Fun Ship" motto. Please join us through this daily diary as originally reported on All Things Cruise. Almost time to start packing. On July 16, Pam and I leave for a summer getaway to the Bahamas aboard Carnival Liberty. Liberty, launched in 2005, was the first Carnival ship to undergo the "Fun 2.0" transformation in 2011, an almost one billion dollar-initiative to add new features and experiences across the Carnival fleet. Those included an outdoor theater, Guy Fieri's Burger Joint, RedFrog Rum Bar, BlueIguana Cantina, Alchemy Bar, EA Sports Bar and a DJ nightclub. 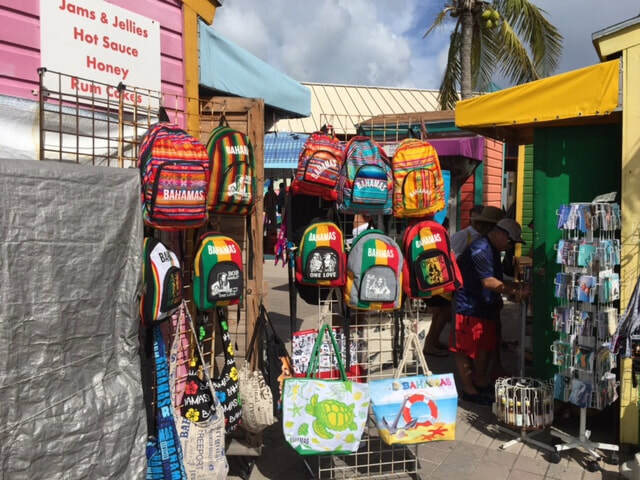 Our 4-night, 5-day itinerary includes stops at Nassau and Freeport, and you know what that means: Shopping. For the most part, Pam usually bypasses the mainstream shops and heads for vendor booths along the side streets, where she has scored good deals in the past. Earlier this year, Carnival announced the signing of a multimillion-dollar agreement to build a new cruise port in Freeport. Set to be located on the eastern side of Grand Bahama Island, it will accomodate two large ships at a time and feature a beach with recreational activities. Final approvals and permitting are still pending. You might recall Liberty made news in 2015 for an engine room fire when the ship was docked in St. Thomas. There were no injuries and it was recently reported the National Transportation Safety Board attributed the cause to loose bolts. At 110,000 tons, Liberty will accommodate almost 4,000 guests at capacity. We'll be departing from Port Canaveral, which is a first for us. We'll let you know how parking and embarkation compares with Miami and Fort Lauderdale. So grab your favorite hat and cocktail and come along. The blue waters of the Caribbean are calling our names. ABOARD CARNIVAL LIBERTY -- Outside our stateroom balcony door a brilliant afternoon sun reflects on the deep blues of the Caribbean Sea. We are just underway on a 4-night cruise to the Bahamas, departing from Port Canaveral, and it's a beautiful day for cruising. We normally make our departures from Miami and Fort Lauderdale; this is our first experience with Canaveral. I'm happy to report it was all positive. The port is a two-hour-plus drive from our home base of North Palm Beach. Rather than park at the cruise terminal ($20 a day), we opted to try a near-by service we found on the Internet called "Park N Cruise." The rate is $6.95 a day and includes a shuttle to and from the ship. Their personnel was both friendly and efficient,exceeding our expectations. In fact, we paid the extra $10 for valet to have our luggage taken care of and our car waiting when we return. A woman riding with us on the van said she is so impressed with their service she opts to cruise out of Canaveral even though other ports are closer. The boarding process itself was a breeze, thanks to the Priority Boarding status Carnival gave us -- thank you, Carnival! Seriously, if you can swing it, do it. 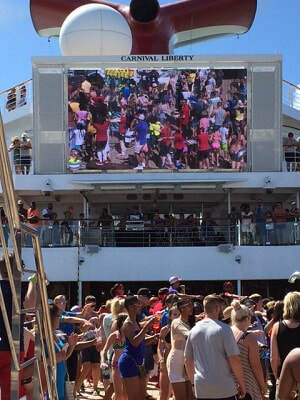 Liberty was the first ship in Carnival's fleet to get the "Fun 2.0" makeover, which added new dining and entertainment options. Over the next few days, we'll sample as many of those as we can. "FUN" is the three-letter mission statement and mantra for the Carnival brand, which accounts for so many young people and families onboard. And trust me, fun was in full swing on day one, especially on the Lido pool and party deck, where a mass of gyrating humanity lined-danced to a pulsating Caribbean beat. * Our stateroom is 6445, a balcony room near the aft elevators. It's tastefully furnished with an impressive amount of storage options for its size. With only one 110 outlet available, it's a smart idea to bring an extension cord for your phone chargers and electronics. One minor glitch was the mini-frig, which was not working. * Definitely download the Carnival app. You can use it with the ship's WiFi and it provides all the info you need to plan your cruise, including detailed menus, for your entire cruise, as opposed to the daily printed planner. * Speaking of WiFi, the ship's Internet service so far has been fast. Offering better connectivity at sea is quickly becoming an industry standard, thank goodness. 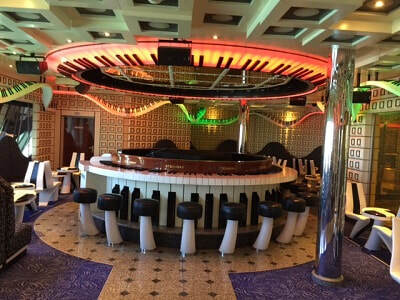 * Looking for a late night drink spot, we considered the Piano Bar, a whimsical retreat where piano keys wrap around the ceiling and a Billy Joel-style singer holds court at a round table. 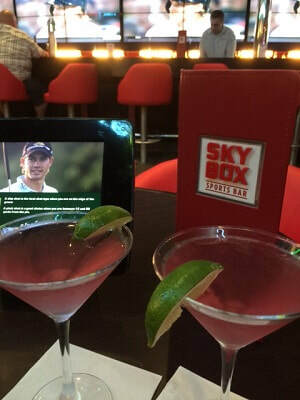 But Pam opted -- somewhat surprisingly, I might add -- for the SkyBox sports bar, which I think is a first. She liked the red leather wraparound booths while I enjoyed the room-length wraparound TVs. The SkyBox Special martini proved a delicious choice. Tomorrow is a sea day. While our Bahamas destination is not that far away, we are taking it slow and easy, which is perfectly fine as we enjoy gently gliding through the waves. ABOARD CARNIVAL LIBERTY -- According to the calendar, it's Monday. But somehow at sea, all days seem alike. We are moving, slowly but surely, toward our first port of call -- Nassau. In the meantime, the fun goes on for the several thousand passengers aboard. Our first stop is the Silver Olympian Restaurant, the two-story main dining room, where they are serving brunch. It's a beautiful room, ornately decorated in an art deco style that harkens back to the theaters of the 30s and 40s. We had dinner here the night before, and found the food very good to excellent. At brunch we share a table with another couple from Tennessee. This is their second cruise on Carnival and they are big fans of the Carnival app, which has helped them plan their activities for the week. Afterwards, not really seeing myself as a serious contender for the "Hairiest Chest" competition at the pool, I take the stairs up to Deck 14 and the adult refuge known as "Serenity." 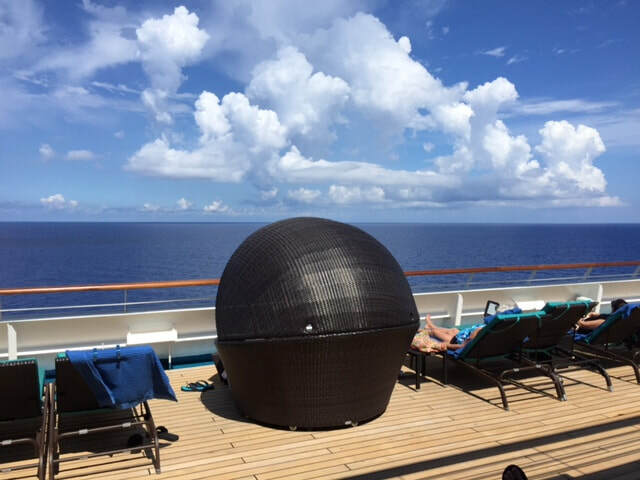 Restricted to guests 21 and older, it offers chairs and loungers where guests can read a book, sunbathe or just relax at the highest point on the ship. I order a drink at the Serenity Bar and join the others watching the waves go by, blissfully unaware my better half is participating in her own private shopping spree on Deck 5, where they have rolled out tables of bargain merchandise at prices too good to be true. Power relaxing or power shopping -- Liberty has something for everyone. Of course, all that relaxing and shopping makes one hungry, so it's soon time to check out the dining options on Lido. 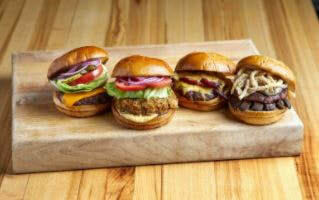 * Guy's Burger Joint: Yes, from one and the same Guy Fieri of the Food Network. The burgers here are thick and juicy and you customize the trimmings. Find it by joining the longest lines by the pool. * BlueIquana Cantina: Go South of the Border. One line for tacos, another for burritos. Very fresh ingredients for your Tex-Mex cravings. * Mongolian Wok: You pick out your perfect noodle bowl and pair it with the meat and sauce of your choosing; the chefs do the rest. It's popular and not as fast as a burger or burrito, so be patient. * Old Fashioned BBQ: I do love me some BBQ, and this fills the bill. Located above the Lido buffet on Deck 10, choose chicken, pork or brisket and don't miss the molasses beans. Then there's the buffet itself, which runs the gamut from blue plate specials and salads to Italian and deli favorites. And you can't walk by The Sweet Spot without trying at least one, and probably two, of the desserts. With lunch accomplished, Pam has her sights set on the casino, located on Deck 5. Lady Luck wasn't very kind on the first night, but her luck changed today. Win some, lose more is our typical day at the slots. The dress code of the day is "cruise elegant." That translates to no jeans, shorts or flip flops in the better dining rooms. It's also the "go" signal for the ladies to break out their finery (guys, too). And this evening, the glitz and glam is on full display, including a tux or two. Photographers are swarming like ants on the Promenade Deck to capture the moment for posterity, and have all the business they can handle. Tonight Pam and I head up to Deck 10 where we have a reservation at one of Liberty's two specialty restaurants, Diamonds Steakhouse. It's not cast in your typical dark wood and country club motiff, but more in the mode of "cruise elegant." The wait staff was very friendly and attentive -- Daria from Ukraine took good care of us -- and the food excellent. As non-steak eaters, our sea bass was expertly prepared, as was the rest of our meal. 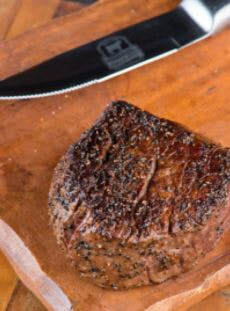 It was well worth the $35 upcharge, especially for devoted steak lovers. 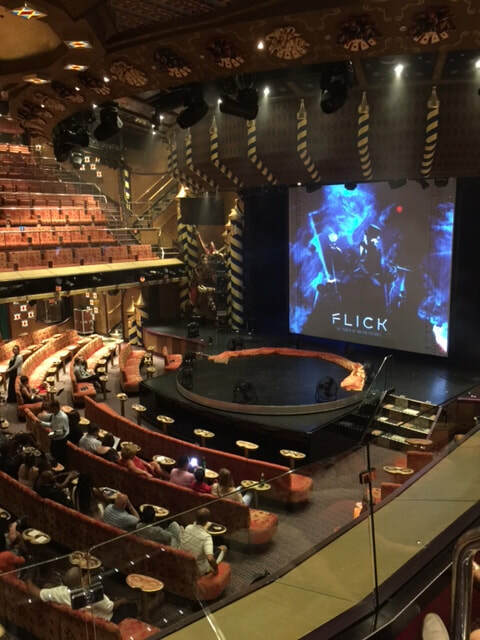 Afterwards we headed for the Venetian Palace, the showroom at the front of the ship, to see "Flick," a multi-sensory tribute to Hollywood. On the way we pass by the giant outdoor movie screen where the "dive-in" Seaside Theater is showing "Kong Island" to several hundred huddled in deck chairs. "Flick" featured some amazing visual effects, as well as some great voices. But we never quite figured out what the role of the guy with the Frankenstein-look and glittery hair was supposed to be. We end the evening with a champagne toast in our room (you can bring two bottles of non-hard liquor aboard). Good news: Our mini-frig is working again. It took less than five minutes for the service person to diagnose the issue: Someone had turned it off. Guy Fieri's Burger Joint is always jumping. The U.S. State Dept. advises visitors to the Bahamas to be on alert as there has been a recent rise in crime here. Persons should be especially careful when they venture off the beaten paths. We plan to remain in the immediate downtown area near the docks, but we'll certainly pay extra attention to what's around us. Bedside us is Disney Dream, and from our balcony we see an army of people descending on the city. We grab breakfast in the main dining room (much recommended, BTW, vs. the Lido buffet) and join them. As soon as enter the terminal area, we can see something has changed. The shops previously located in the here are all outside it. The reason: Renovation and repairs. No matter -- Pam had always patronized the vendors who sell their home-made jewelry on the adjacent streets. As we head downtown, through dozens of tour operators, taxi drivers and offers of horse and carriage rides, Pam senses another change: Where are the street vendors? After inquiring, it turns out they are out of business. The reason given was complaints by customers, but you have to wonder if it was more about shutting down the competition. At any rate, with the sun beaming down we decide to head back to the ship and something cold to drink. 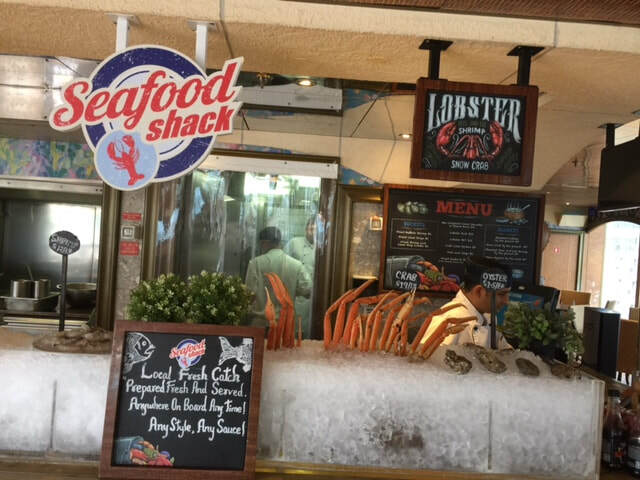 Lunch time arrives, and we are off to Deck 9 to sample the Seafood Shack. It is the other extra charge dining option on the ship, but it's not a restaurant per se. More like a specialty kiosk, occupying the corner opposite Pizza Pirate. We both opt for the fish and chips ($6). The fish portions are generous and the fries are good and double crunchy. If you have a craving for seafood, it's worth trying. As we preview the afternoon activities, one jumps out: The Sorry competition. 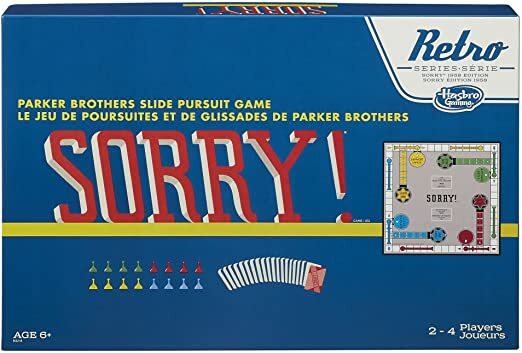 Not as in "bad or weak," but "Sorry" the game. Yes, we readily admit we are nerds for the popular board game,which is one of our favorites. In this version, the participants form teams and act as pawns on a giant Sorry board. There are eight of us playing, and we move along the board according to cards drawn by our host. It mirrors the actual game with a few exceptions; the object is for your two-person team to be the first to finish. The Sorry gods didn't smile on us, so we didn't get to claim the Carnival trophy. But it was fun. Now, where do we one of those life-size boards? Tonight we return to the main dining room for dinner. Afterwards, Pam finds more shopping deals, helping to ease the disappointment of Nassau. Back in the stateroom, we take a seat on the balcony and marvel at the beautiful sight of three other cruise ships on the horizon, including Disney Dream. The warm night sky is ablaze with stars as Liberty glides quietly toward our final port of call, Freeport. Hard to believe we are almost to the last day of our cruise. It always goes by so fast. ABOARD CARNIVAL LIBERTY -- We left Port Canaveral four days ago and this morning we are 80 miles from where we personally started our trip -- Palm Beach. Liberty is docked at Freeport, Grand Bahama, an international hub for shipping and commerce which also welcomes over a million cruise visitors a year. No question it's a busy, working port, evidenced by a giant MSC cargo ship that blocked out the windows during breakfast in the main dining room. Actually, Carnival announced in May it is working with the government of the Bahamas to constuct a new terminal with added amenities in Freeport, which is still pending final approvals. In the meantime, the current terminal hosts a number of shops, a craft market and restaurants, as well as transit to the popular resort area of Lucaya. 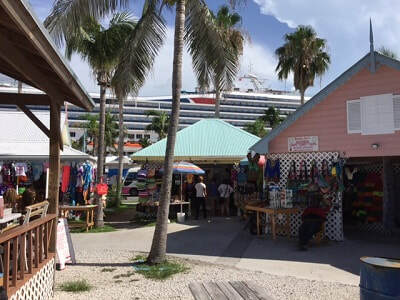 This is our first visit to Freeport, and while we would normally book a shore excursion, we decide to explore on our own. Of course, for Pam "explore" translates to "shop." She scored a few deals while I scored a cold drink. Call it a "win-win." Unless you are joining a tour, the "hop on, hop off" bus or renting a vehicle, it doesn't take long to make the rounds and head back to the ship. One area that I haven't reported on this week is everything Carnival offers kids, probably because we have no kids traveling with us. But it is worth noting and a major reason so many families choose Carnival. * Green Eggs and Ham Breakfast. 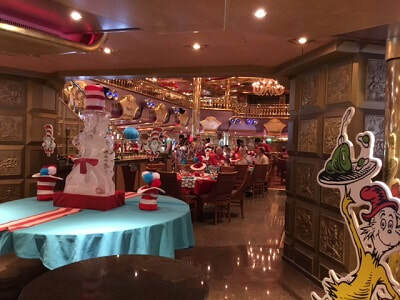 For an extra $5 a person, join your favorite characters from Dr. Seuss and enjoy funky-colored food set on brightly decorated tables. * Camp Carnival. Catering to three age groups, ranging from 2-11 years, children are entertained with age-appropriate actvities while parents enjoy some adult time. It offers late night hours as well. * Camp Ocean. Structured much like Camp Carnival, except with nautical-themed things to do. This is our last full day, and Cruise Director Donkey -- "the voice from above" -- is busy announcing bingo games, art auctions and the night's entertainment offerings, which includes "America Rocks" in the main showroom. There's also "Towel Folding Fun," so you too can turn ordinary bath towels into your favorite animals. As for us, we'll have a farewell cocktail in the atrium bar on Deck 3, then dinner in the main dining room before it's time to pack up. We'll wrap it all up in one last post after we say our goodbyes to a week of fun on Liberty. 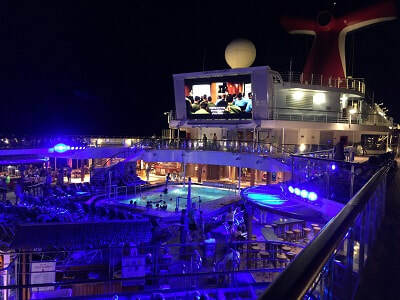 ABOARD CARNIVAL LIBERTY -- It's just after 6 a.m. Liberty's captain is making the final approach to Port Canaveral. You know what that means ... the cruise is over. For the 3,700-plus guests onboard, they grab breakfast one more time and begin the wait to leave the ship. The fastest way off the ship is take your own luggage when your deck is called. The other option is check your bags the night before and wait for your luggage tag to be announced. We do the latter and fall into group "17." The first leaves by deck; the second by a range of tags. It's a longer wait for us, but then we don't have to wrestle our bags all over the ship, either. Last night at dinner Gobi, the maitre d at the Olympian Dining Room and a 26-year Carnival veteran, summoned his wait staff for a farewell send-off. 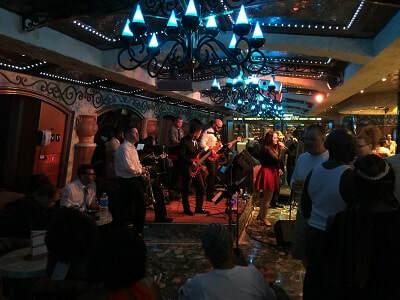 But instead of the standard parade of chefs, we were treated to a sizzling song and dance revue that could hold its own in the Venetian Palace Theater. They had the room rockin'. And it underscored the "fun" factor that runs throughout the ship. 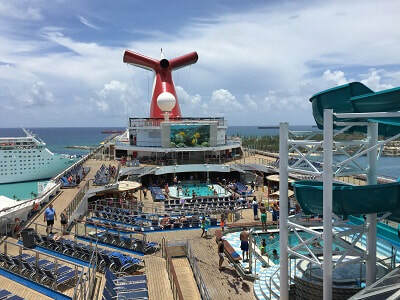 * With its focus on fun, family and value pricing, many first-time cruisers choose Carnival, including a number of people we met on this cruise. 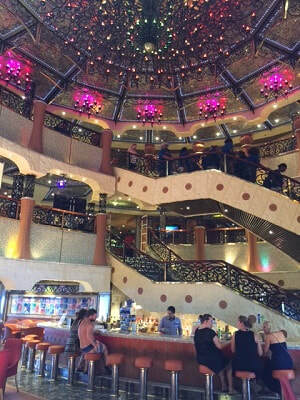 As a matter of fact, our first cruise was on a Carnival ship. With the new Fun 2.0 features on Liberty, it's likely most newbies will come away satisfied. * On the "needs improvement" list, include the muster drill. Yes, all muster drills are a pain and a necessary evil, but many ships now conduct them indoors in large public spaces where guests can at least take a seat. On Liberty, everyone is herded into tightly-packed lines on an outdoor deck. If you are adversely affected by heat or claustrophobia, be prepared. * With lots of kids and young adults aboard, the fun can sometimes be noisy and frenetic. Expect some traffic jams on Lido and Promenade, where most of the action is centered. If you need a buffer to get some sleep, we recommend one of the "white noise" machines or apps. 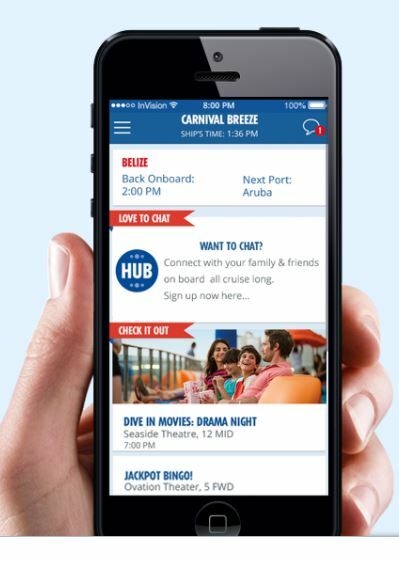 * And speaking of apps, major kudos to Carnival for the "Hub" app. It works on your phone when set on "Airplane Mode" using the ship's WiFi. You have the daily planner and more right at your fingertips, including a real-time update of your spending. Check "What's Happening," Food and Drink, shows, deck maps -- even menus. * Liberty, launched in 2005, was madeover in 2011, and boasts some eye-catching architectural touches in the big rooms, along the decks and in the atrium lobby -- a mix of art deco, fantasy and industrial tech. It's a design mash-up that is both odd and interesting. * Thumbs up to the staff, who were uniformly friendly and attentive, and well-schooled in keeping the fun theme going. Bottom line: If you're looking for a quick getaway to the sun and sand of the Bahamas, and love to party, Liberty has a stateroom waiting for you.